The National Cornbread Festival is just a few weeks away! It has been and continues to be one of my most favorite, family-friendly festivals. I’ve been fortunate enough to be a judge for the National Cornbread Cookoff, sponsored by Martha White, for the last few years. Now, let me tell you… that’s some good eatin’. And though I won’t be able to join them this year, I promise you, if you make the trek to the tiny town of South Pittsburg, Tennessee for the festival, you won’t be disappointed. The whole town turns out to make this event a success. I’ve always been impressed with the kindness and grace shown by the folks from South Pittsburg at this event. Each year, I like to play along and pretend I’m creating a recipe for entry into the cook-off. 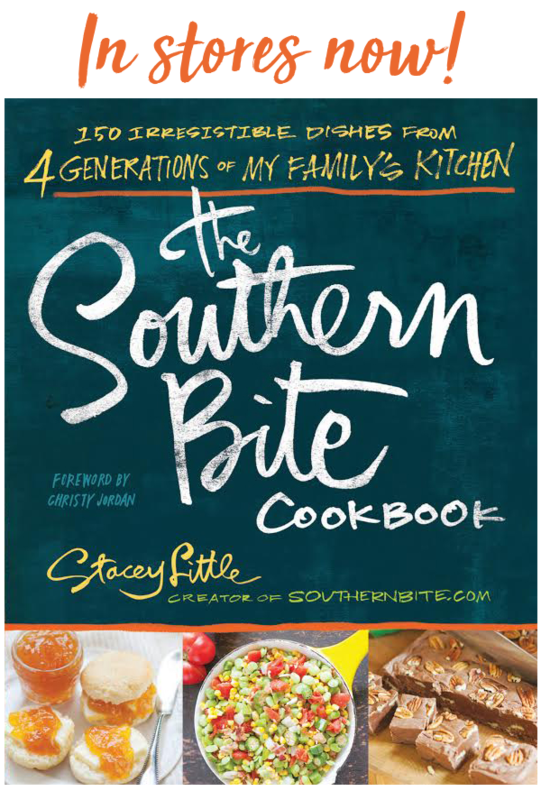 The recipes have to include a packet of Martha White Cornbread mix. This time, I decided to start with a product I hadn’t ever used before, the Mexican Style mix. 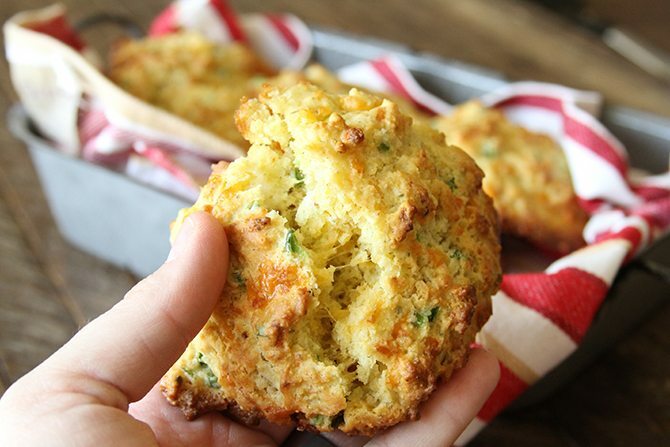 Playing off of the flavors in the mix, I created these absolutely delicious Cheddar Jalapeño Cornbread Drop Biscuits. 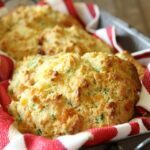 The great thing about this too, is you could start with nearly any Martha White cornbread mix and use the basic recipe, adding in whatever your favorite flavors might be, to create your very own take on these cornbread biscuits. And since they’re drop biscuits, there’s no rolling out or cutting! Y’all know I’m all about easy, right??? 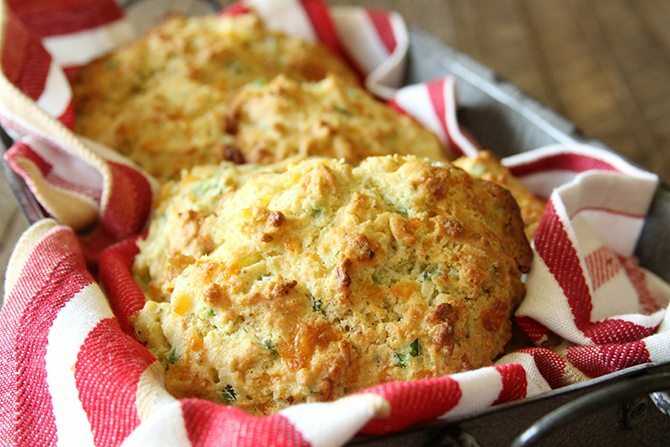 I just know y’all will enjoy these biscuits and I know you’ll enjoy your time at the National Cornbread Festival if you can make it over that way. There’s certainly a good time to be had for all! Y’all enjoy! Preheat the oven to 425° F and spray a baking sheet with nonstick cooking spray. In a medium bowl. combine the cornbread mix with the self-rising flour and garlic powder. Cut the butter into the mixture with a pastry blender or two butter knives until the butter is cut into pieces the size of peas. Add the jalapeños and cheddar cheese. Pour in the milk and stir to combine. Drop in half-cup measurements onto the baking sheet leaving about 3 inches of space between each biscuit. Bake for 18 to 20 minutes, or until golden browns and cooked through. Serve warm. These biscuits are not really hot as removing the pith or ribs (white part inside) is where most of the heat is. The jalapeño just gives them a nice flavor. If you're still concerned about them being too spicy, simply use just one jalapeño. If you like heat, simply remove the seeds and leave the ribs intact, then chop. This post is sponsored by my good friends at Martha White and the J.M. Smucker Company. But, I assure you, the thoughts and opinions are all my own… just as always. so sorry we don’t have these mixes in CA! 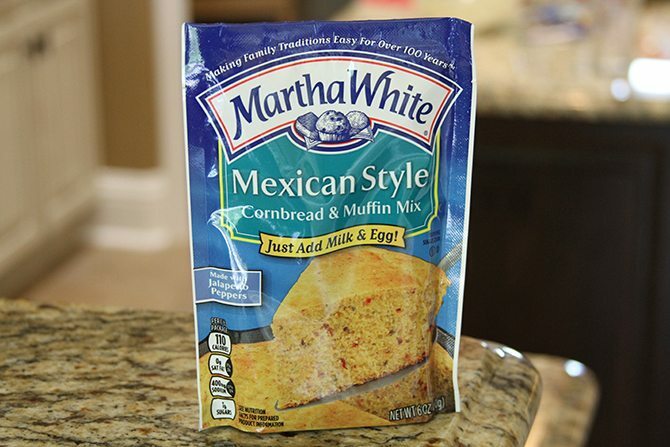 You can order online from http://www.marthawhite.com/baking-products/cornbread/mexican-style-cornbread-and-muffin-mix. We can’t get them in AZ either. Thank you…I was just about to ask if any other brand of cornbread mix will work well in your recipe? WA State . We have JIFFY, KRUSTEAX and maybe some others. 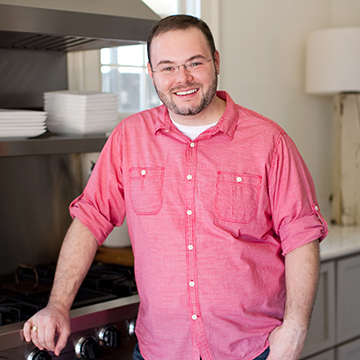 Also, please note that it’s nice to have recipes from guys…often guys have an impressive taste that us ladies may need to know about, when cooking for our guys!! I’ve been using this Martha White jalpeno Cornbread mix for long time now. It is quick and easy. I’ve found that adding a bit of cooking oil makes it better, more moist. I have also added fresh jalapenos for an extra kick. 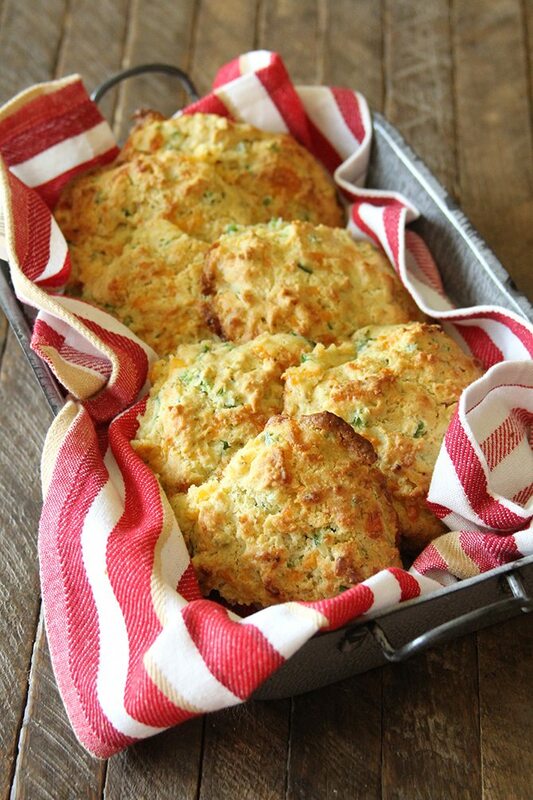 Your cornbread/biscuit recipe sounds good, I will try it soon. Thanks for all the good recipes and tips. Thanks, Alice! Love to hear you’ve enjoyed the mix. Stacey, I’ve printed the recipe, and I’m making these for our Annual Adult Easter Egg Hunt/Party this weekend! The “big kids” are going to love these! Thanks! Great idea, Lynn! We moved from Colorado to NW Florida last year. We brought 3 bushels of frozen roasted chiles with us. Three bushels!! I sure hope they do! Y’all have a GREAT time! I did and they love them. Please do not hate me for saying this, but I did change it a little. We have some whimps and some little ones so I did cut down on the jalapeno. LOL I even fried some like hushpuppies! 2 thumbs up and/or 5 stars! Thanks Stacey!!! Stacey, I love the ease of drop biscuits (yeah, I can be lazy that way 🙂 ). I have roasted frozen Hatch hot green chile in my freezer. Bet one of them would be a great substitute for the jalapeno. I enjoy the heat. Thanks for the recipe. Awesome! Great idea with the corn! My husband’s favorite new cornbread recipe! These were a huge hit so I’m making a few batches for our tailgate this weekend to go with chili. Thank you for a fabulous recipe! They’d be great with chili! So glad he enjoyed them, Diane! Can you use any cornbread mix? As long as it measures the same amount. Though, for consistency and best results, I recommend the one I used. I’ve never had that trouble. Are you sure you measured the liquid correctly?